I held back for a couple of weeks before writing this season review, keeping in mind the fact that most House Of Cards viewers, unlike myself, would sensibly pace themselves to both savour the show and maintain the order of their personal and professional lives. Unfortunately, that kind of rational is not for me, and within twenty four hours of season three of one of Netflix’s most popular shows dropping, I had binged to the depths of sanity and back and watched the whole damn thing. Having been left screaming in anticipation of the Presidential high-jinx that Frank Underwood and his First Lady Claire could get up to now ascended to ultimate rank, in a logged and on the coach I sat for thirteen hour journey in to the ever trembling House Of Cards. 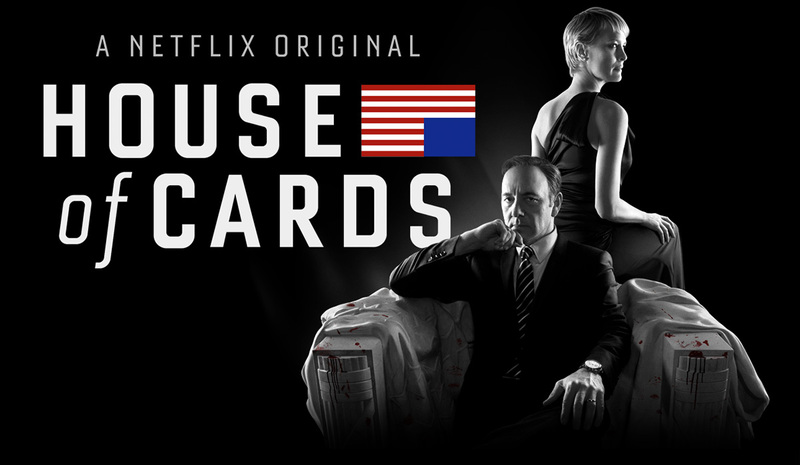 Season three of House Of Cards picks up several months in to President Underwood’s (Kevin Spacey) administration and, as one would expect, there is already plenty of descent amongst the Democratic camp both towards Frank as an individual and a number of bold, unsupported decisions he is starting to push through without majorative consent. Two of these such decisions come in the form of the President’s ‘America Works’ initiative, a programme rolled out to guarantee a job in Washington D.C. for anybody that wants one, and in his appointing his wife (Robin Wright) as Ambassador to the United Nations. Quite frankly, apart from confirming Frank’s ruthlessness as he irresponsibly takes billions from one government fund and feeds it in to another, ‘America Works’ provided little interest to me throughout the season. Claire’s ambassadorship, however, proves to be one of the most captivating subplots of the season and not only gives Robin Wright a chance to shine but also tests the boundaries and breaking points of Frank and Claire’s marriage more than we have ever seen before. The main arching storylines this season cover two extremely topical and close to the bone foreign policy topics, one being the Israel/Palestine conflict and the other being a portrayal of the USA’s relationship with Russia including the show’s very own ‘fake Putin’, President Viktor Petrov (Lars Mikkelsen). Whilst ‘America Works’ and the details of the Israel/Palestine arguably provided some hard politics for the show’s credibility, House Of Cards engaged in some of its campest and overripe moments so far in its depiction of Petrov and his Bond villain-esque presence. From downing vodka shots at the White House dinner table, to singing Russian folk and American swing at the piano, to planting a sinister smacker on the First Lady’s lips, the injection of Petrov and his at times comical villainy were farfetched at points but undeniably some of the most memorable moments of the season. Away from the White House, viewers were stunned to discover that Doug Stamper (Michael Kelly), assumed dead and gone from a brick to the face, was in fact alive and recovering and hell bent on seeking revenge on Rachel (Rachel Brosnahan) for her attack on him in the season two finale. Removed from Frank and his activities for the majority of the season, Doug’s storyline felt like something of a disruptive force, slowing the pace of the show each time it was given heavy focus, but in true quality TV fashion the show makers managed to tie the two separate narratives together enough for me to be satisfied by both in the end. Kevin Spacey is, as always, outstanding as Frank Underwood. In true Breaking Bad/Walter White fashion, Spacey portrays the perfect antihero, committing despicable crimes left, right and centre but always possessing the audience’s consent because, quite frankly, it is so damn fun to watch him do it. Fourth wall breaks that would be utterly cringeworthy at the hands of lesser actors become moments of pure gold for Spacey, and season three gives us all the ruthlessness and bravado of Frank to which we have become accustomed whilst also showing at times a much more vulnerable and contemplative character, a lot of nuance to work with but Spacey covers the ground effortlessly. It has to be said, though, in spite of the leading man’s fine performance, this season’s undoubted star of the show is Robin Wright as Claire Underwood. With the UN ambassadorship, personal battles with Petrov and an ongoing contemplation of the state of her marriage to Frank, Claire is given much to deal with this season and Wright is nothing short of sensational throughout, giving a performance that spans ice queen, power boss, and both doting and hateful wife in equal measure. 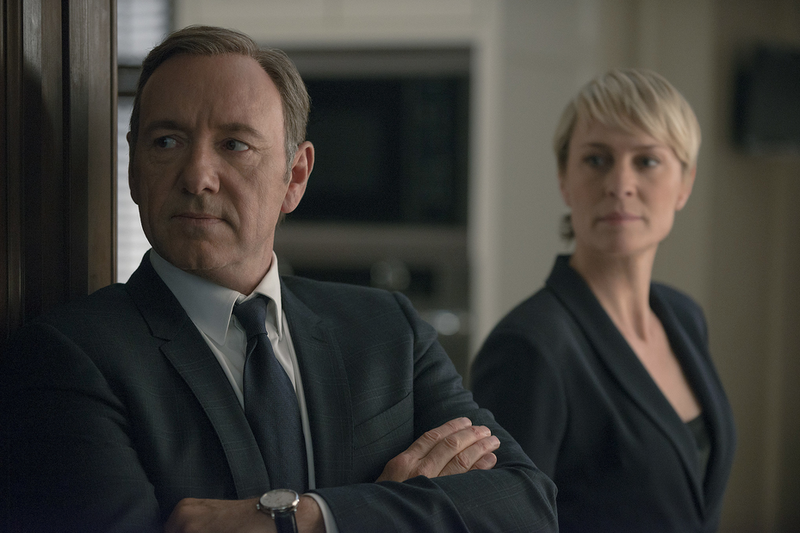 The sheer power of presence when the two actors are on screen together is what makes House Of Cards as magnetic and enthralling as it is, and some of the shows most powerful and dramatic moments arise from conflict not between two heads of state but between a strong willed, captivating husband and wife. Overall, it would be fair to say that House Of Cards season three takes a couple of episodes to find its groove but from then on is up there with some of the most enthralling and addictive drama I have seen in recent months. At it’s worst it harkens back to the silly computer hacker levels of season two, and at its best it rivals any of the best Zoe related storylines from season one, all held together and perfectly presented by some of the best acting talent you will ever witness on a television show. In true Godfather Part I fashion, we have seen a pretender to the throne rise through the ranks and ascend to power, and season three is beginning to provide us with a little Godfather Part II style empire crumbling with plenty of room and story still left to tell. Let us all pray that we never reach the depths of any kind of Godfather Part III analogy.